JESS3 and I debuted versions 4.0 and 4.1 of The Conversation Prism (TCP) recently to an overwhelming response. Thank you. The initial post was intended to share the evolution of the popular infographic along with the transformation of the social landscape over all. Over the years, new startups, sunsets, acquisitions, mergers, and shifts in trends and technology have played out in true Shakespearean fashion, which has made for truly dramatic theater.Excietment and turmoil aside, The Conversation Prism is in of itself, one of the industry’s most comprehensive visual studies of how we use networks and how that changes over time. 1) It was not intended to over-complicate social media. 2) It is not designed to exclude any service, merely represent behavior and some of the promising networking within each category. 3) It is not meant to be all-inclusive. In fact with 4.0, we’ve sparked development of new TCP’s to focus on important vertical markets. If you have thoughts or feedback, please provide them in the comments section. I listen. 4) Taking issues with an individual spectrum is welcome. But I challenge you to think about intention and the CENTER of the prism to make the conversation more productive rather than a debate that is out of context from the onset. 5) This is designed to help you. Downloads in various sizes and shapes are available freely for you to download and share. Take your pick here. Because many have asked, it was also printed as a high-quality 22 x 28 poster. You can order it here. 6) And, yes…it’s unfortunate that the word Prism also means something else now. However, it is what it is. In many ways the irony is too great to abandon. In the very least, The Conversation Prism represents an ongoing exploration in digital ethnography providing a unique snapshot in time of the social landscape dating back to 2007/2008. Comparing each version will provide an excellent foundation for historical research. It’s a catalyst for analysis, dissection and most importantly, interpretation and conversation. At the center of all of this is YOU and that’s what I’d like to focus on today. The hub of The Conversation Prism is comprised of four concentric circles that visualize a continuous cycle of renewal. Each halo builds upon the other to advance strategies and intentions as we experiment, learn and improve. The center of TCP is literally “you.” This was intentional and true going back to version 1.0. You have no business creating a presence in every network. You should only manage a presence where it’s warranted. Whether you’re merely listening or building communities, the idea was to explore your opportunities beyond the usual suspects (Facebook, Twitter, Youtube, Instagram, Pinterest, Vine, et al.) and find the networks where you can gain or introduce value. Value is to be defined however as it’s not solely relegated to traditional ROI. Brand resonance or equity, relationships, reciprocity, thought leadership, intelligence, etc., are all on the table. Halo 2: Vision. Purpose. Value. Commitment. Transparency. Once you’ve defined the YOU and the role you play or wish to play in social, consider the pillars for meaningful engagement. Vision – What is your vision for social media and how would you articulate it to your executives and stakeholders. Purpose – What is the motivation or grounds for social media and how can it be justified against other investment opportunities? Value – Social and relationships involve more than one party and value must be mutual. What is the value you intend to deliver and how will you assess and communicate value? Commitment – Before you invest in social, understand the commitment necessary to provide and gain value as you scale. Allocate accordingly. Transparency – This is an era of business where information isn’t only democratized, networks and nodes are becoming human. It’s essential that all of the pillars above are communicated and enlivened in all you do and say. Social is not a silo or a function, it is a way of business. It is intended to mature business perspective from a command and control mentality to that of engagement and openness. As such, it’s bigger than marketing, it affects employees, customers, and all of the processes and systems that exist between them. Halo 4: Always Be Improving (ABI) – Listen. Learn. Adapt. Often, there’s what you want to talk about and what they (customers and employees) want to talk about. Mutual value lies somewhere in the middle. It’s often said that the best listeners make the best conversationalists. The last stage in the center of The Conversation Prism reminds us of the importance of listening. In doing so, we learn and adapt to improve all that we do inside and outside the company. Each of the concentric circles is designed to work together, to help you improve strategies and results to improve the way you work, how you build relationships with employees and customers, the ability to create and improve better products, services and experiences, and overall, the role you play and the stature you earn as a result. For more, please visit theconversationprism.com. ‘Informasi’ yang menarik … Terimakasih. Gorgeous meta-venn diagram. It’s a pleasure to follow both you and your content! Very well crafted post Brain, loved your graphic representation of prism. Exceptional thinking! 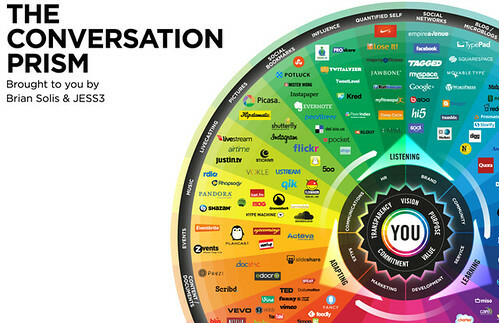 This conversation prism “Infographic” will always be relevant till a new disruptive technology & model emerges! I love your Conversation Prism. I am trying to see where the virtual worlds from 3.0 are now included. Can you please advise at christina.clements@humber.ca? I use this in my social media classes.Thanks! Hi Brian, until now I’d been using TCP right at the beginning of my presentations generally to shock people by showing them social media is far, far more than facebook. I’d never actually read further into the aspects you’ve described here. In future, I will definitely explain more in relation to TCP. Thanks so much for this post! Just wanted to give some feedback: In my most recent presentation (last week) I took the time to explain the halos of TCP as you’ve done here in this post. The audience – a German one – listened and discussed with great interest. All are now determined to put the principles into action. Good stuff indeed. Thanks again! Wonderful to hear Rebecca. Thank you for sharing! Thanks so much for the continuous updating, I was just wondering, if there was anywhere, where the categories within the prism are explained? Brian ,i need help . what is the basic purpose of this program?